In addition to our community service projects and scholarships we also allocate a part of our annual fundraising to partner and support other Kauai nonprofits. We support specific projects that benefit the community and are related to our Rotary areas of focus. Grant applications must have a Rotary Club of Poipu Beach sponsor. Rotary is a global network of 1.2 million neighbors, friends, leaders, and problem-solvers who see a world where people unite and take action to create lasting change - across the globe, in our communities, and in ourselves. The mission of Rotary International is to provide service to others, promote integrity, and advance world understanding, goodwill, and peace through its fellowship of business, professional, and community leaders. The purpose of our Community Grant Program is to provide assistance in areas of significant need in our community here on Kauai. 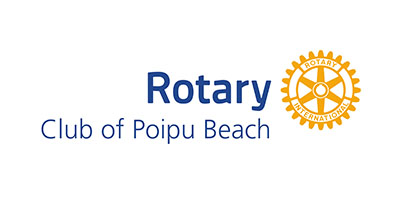 Rotary Club of Poipu Beach provides grants to various community nonprofits on Kauai. Grant awards generally range from $100 to $1000. 1. Complete, specific, informative. Please make sure form is completed in its entirety, including all sponsoring Rotarian contact information. 2. A Rotary club member must sponsor the grant application. 3. Purpose of grant request and/or specific project should be clear and to the point. Vague requests will be rejected and/or returned to the sponsoring Rotarian for more information. The sponsoring Rotarian and applicant will receive a confirmation email within two business days from Nancy Kanna when the grant application is received. The purpose of this is to make sure no grant is lost in the shuffle of emails.